The Belgian VFX Guy: VFX Back to Basics Series: 2. What is 3D modeling? VFX Back to Basics Series: 2. What is 3D modeling? In this second post I will talk about 3D modeling. 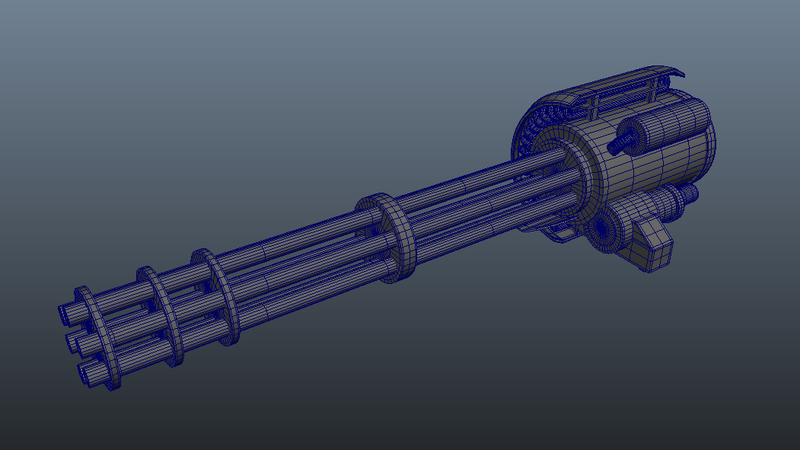 A 3D model of a gun. Last time I was talking about rotoscoping which is what we call a 2D operation. We can manipulate the rotocurves only in two dimensions, height and width. In this post I am taking you into the 3D realm and I don't mean the stereoscopic view mode which you can see in the theaters while wearing funny glasses. This is real 3D with height, width and depth. Unfortunately "3D" stuck as a commercial term for selling cinema tickets and new TV sets and now it confuses the layman people when I talk about 3D. So what is the point of working in a 3D space for making pretty pictures. The answer is simple. If there was no 3D we would have to make computer graphics objects frame by frame like artists drawing cell animation. That would be quite time consuming and highly inflexible. Don't get me wrong. 2D elements like matte paintings do exist and are extremely useful for VFX but it would limit us a lot. We can move around 3D objects, translate and rotate them so we can see them from all sides. This also means we have to light a shot only once. Once a model is made we can use it over and over again and the virtual camera will give us always the right perspective. There are a plethora of 3D packages out there for you to start modeling with and I can't really say which one is the best as I haven't tried them all. I use Maya as it is one of the most used packages in VFX. 3ds Max, Softimage XSI, Houdini, Lightwave and so many others are also great packages to try your modeling skills on. There are several stages which artists have to complete before a photorealistic 3D animated creature or a futuristic city can be shown to the public. The first step is to create a model. You can see it a bit as a sculptor making a clay object. Especially with programs like ZBrush and Mudbox this metaphor becomes almost a reality. The more classic way however is to build a model made out of polygons, NURBS or subdivision surfaces. These are three types of surfaces to represent the "skin" of your object. Polygons are flat faces with three or more edges. By connecting these flat faces you can get a blocky surface. The more polygons you use the smoother the blocky surface will be but it comes at a price. The model becomes heavy and your computer will churn to a halt as it can not process the amount shown on your screen. They do model quite easy though and are usually used for games and low quality media. A NURBS (Non Uniform Rational B-Splines) surface is a parametric surface built on a mathematical formula. This actually means they are extra smooth without making an attempt to kill your GPU for showing them on the screen. The drawback is that they are harder to texture since a surface patch is always square. They are usually used for design and CAD imagery. Subdivision surfaces try to combine the best of both worlds. They are represented by a course polygon cage but give a smooth surface as a result. They texture almost as easy as polygons with the smoothness of NURBS without the need of a gazillion polygons for the cage. They can have sharp edges as well as rounded ones in the same surface. They are usually used in high quality VFX and my personal preference. Check out the smoothness levels of the different methods. You can clearly see subdivision surfaces are as smooth as NURBS although they have the same polygon cage as the middle objects made out of polygons. Quite an explanation on the building blocks but how can you start modeling? Modeling without an example is usually quite tough. Having a design on paper, a scanned real life object or even another 3D model is a good start by being a template for the model you wish to make. It is always a good idea to begin with a rough model and then refine it as you go along. Putting too much detail from the start will limit your options later on. It is also wise to think about how many meshes you will make for your model. Building one big mesh is very often done for games but will get you into trouble in high detailed photoreal work. A good rule of thumb is to divide them up by the amount of shaders you will apply on them. This will simplify the shader networks you have to build later on and avoids layering them up. There is nothing wrong with layered shaders but there is an extra cost in texture maps. This concludes the second part of the VFX Back to Basics series.